An internationally renowned manufacturer, Birmingham-based Precision Micro produces an amazingly wide range of small components and assemblies, from shims and gaskets, printing stencils and foils, to springs, connectors and contacts. The company also manufactures intricate technical components such as bespoke EMI / RFI screening enclosures for shielding delicate electronics. As the business’ name implies, Precision Micro specialises in the production of high accuracy small parts, and it is within this challenging area that the company has earned a global reputation for its wide range of advanced manufacturing capabilities and the high quality of its output. Supplying such demanding sectors as the Electronics, Medical, Scientific, Automotive, Communications, Aerospace and Defence industries, Precision Micro boasts an expert development team that is able to react to customers’ new project requests within hours, rather than weeks and months. PM’s advanced manufacturing technologies are geared to the production of components of the tightest tolerances, in the fastest possible time scales, all at competitive rates. The flexible nature of Precision Micro’s systems ensures that it is able to accommodate requests for the manufacturing of component volumes from a single, simple part, through to the development and production of millions of high specification components. As a technological leader within a variety of advanced manufacturing techniques, the company continues to push the boundaries of a range of production techniques such as photo etching. For more than 40 years Precision Micro has also utilised electroforming technology to meet customer requirements. Electroforming is used in the production of items such as meshes, encoder discs, foils, filters, orifice plates, micro sieves, optical masks, diaphragms, and other fine and intricate parts. The efficient handling of design complexity is a key strength of electroforming procedures. The company’s expertise within the field of electroforming ensures that the precise execution of minute components and complex features can be accomplished without difficulty. 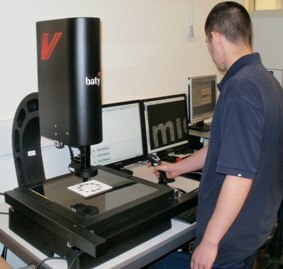 Although PM operates several non-contact Coordinate Measuring Machines, purchased from a well known manufacturer, when recently faced with the need to purchase an extremely accurate, medium capacity non-contact measuring machine, Precision Micro chose the advanced Venture vision system from Baty International. Carl Smith, Precision Micro Quality Manager takes up the story: “Although our existing large capacity optical measuring systems had previously given us good performance, we have been very impressed by the outstanding qualities of our range of Baty optical projectors so, when faced with the need for a medium capacity, non-contact measuring machine, we decided to examine the merits of Baty’s latest offering. “We are always looking to take both waste and time out of each of our projects by constantly developing our systems and investing in the best available technology. Having examined the alternatives, Baty’s Venture proved to be the ideal solution to our needs. Without compromising on accuracy or repeatability, the Baty machine has proven to be extremely quick. Our efficiency has been increased by the Venture’s ability to use the same CAD data as our range of machine tools, whilst inspection data can also be exported to each of our commonly used software packages, such as Microsoft Excel. Our new Baty machine has also proved useful for the rapid reverse engineering of parts and the generation of the required data for the production of new tooling. Baty’s ingenious Venture CNC measuring machines are able to automate the most demanding of inspection processes. The execution of advanced procedures, such as rapid scanning and ‘best-fit’ operations are completed both quickly and accurately, minimising the required man-hours of skilled operators. Further time savings are made by the Venture’s CNC programming routines being based on a simple teach and repeat process. In essence, by measuring a part once, a full CNC program is created automatically. The unit’s high quality zoom lens can also be controlled so that magnification changes are also recorded into each new program. The use of a touch probe is also optimised on a CNC system. Measurements from data points taken using the touch probe can be combined with those taken using video edge detection for optimum accuracy and reduced inspection times. With 250mm x 125mm and 300mm x 300mm XY stages available, Venture’s range of features includes; programmable segmented LED lighting, high-resolution 0.5μm scales for increased accuracy, CAD import / export, fully dimensioned part view, SPC software, one click output to Excel, autofocus, 165mm Z axis measuring range on adjustable dovetail slide and auto program from CAD. On completing a measuring routine, the Venture’s easy to interpret graphical reports display the measured part as a fully dimensioned drawing with ‘in tolerance’ dims shown in green and ‘out of tolerance’ dims shown in red, instantly highlighting pass / fail classifications. For more information on the Vision Systems range from Baty click here.